Yuzvendra Chahal’s career-best 6/42 and half-centuries from MS Dhoni and Kedar Jadhav helped India to a series-clinching seven-wicket win over Australia in Melbourne on Friday, 18 January. Dhoni (87* off 114) and Jadhav (61* off 57) put on an unbroken 121 to seal the chase, after Chahal’s six-wicket haul had kept Australia to 230. The series was won 2-1. The target wasn’t daunting, but on a tricky surface, the chase took a lot out of India, especially after Rohit Sharma was sent back early for a 17-ball 9 by Peter Siddle. Shikhar Dhawan and Virat Kohli then went about steadying the innings. They picked the singles when they could, and for a while, boundaries were hard to come by. The stand was broken just as soon as they settled down, though, with Dhawan chipping one back to Stoinis for a 46-ball 23. India were 59/2, and Dhoni walked in to partner Kohli in the middle. In what proved crucial in hindsight, Dhoni flayed his arms at the first ball he faced, sending it straight to Maxwell – it was a straightforward opportunity, but Maxwell couldn’t get his hands around it. Dhoni and Kohli went on to add 54 for the third wicket. It was a nervy partnership, and there were a couple of times when Australia sniffed run-out opportunities. The two kept the scoreboard moving, though, and after they settled by taking their stand past the 50-run mark, it seemed they would carry on to see the chase through. But Jhye Richardson – impressive throughout the series – had other ideas. He found Kohli in a rare moment of impatience, and the edge was induced when the Indian captain was on a 62-ball 46. At that point, India were 113/3, and still needed another 118 to win. But in Jadhav, Dhoni found an able ally. The two decided to grind the target down, but ensured the required rate was never out of reach. Dhoni soon brought up his third half-century of the series – and the 70th in his career – off 74 balls. As the match wore on, the pressure increased on both sides. But Dhoni, typically, kept his cool, and guided the chase. Jadhav put away the occasional boundaries as well to build the pressure on Australia. In fact, that moment when Aaron Finch, the Australia captain, dropped Dhoni when he was on 74 in the 48th over – Jadhav survived a run-out appeal in the run that resulted from the spill – could likely be the moment the series slipped from Australia. Jadhav then brought up his half-century off 52 balls with a slap to the fence, and that meant the partnership crossed the 100-run mark. The two, a lot more relaxed now, found the fence thrice more to ensure victory was secured with four balls to spare. Earlier, the Australian openers were made to struggle. Bhuvneshwar Kumar was exemplary, again in his opening spell, and he first had Alex Carey edging to second slip off a wide one. Almost inevitably, he followed that up with the scalp of Aaron Finch – for the third time this series – trapping him in front of stumps. Australia were 27/2 and Shaun Marsh, Australia’s in-form man, and Usman Khawaja went about steadying the innings. Runs didn’t come very easily, even with Kohli opting to use Jadhav’s part-time spin and the debutant all-rounder Vijay Shankar in that period. Slowly but steadily, Marsh and Khawaja added a valuable 73, but when Chahal was introduced in the 24th over, he turned things around instantly. He first had Marsh stumped off a wide down leg, and two balls later, Khawaja was caught and bowled off a soft leading edge. 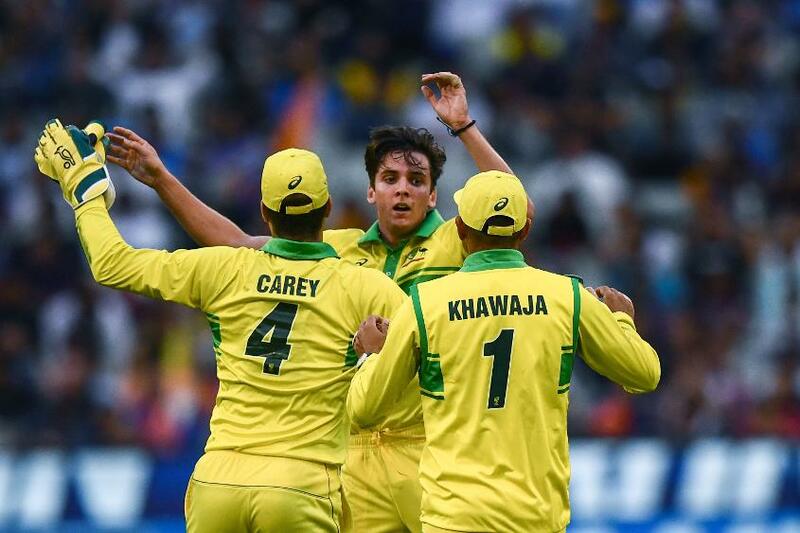 Peter Handscomb and Marcus Stoinis then went about rebuilding the innings, but the wickets kept falling – Chahal had Stoinis caught at slip with a leg break before Maxwell holed out off Mohammed Shami for a 19-ball 26. From 160/6, Australia managed to post 230, thanks largely to Handscomb. His 63-ball 58 – a lot of it while batting with the tail – ensured India had a difficult target to chase. 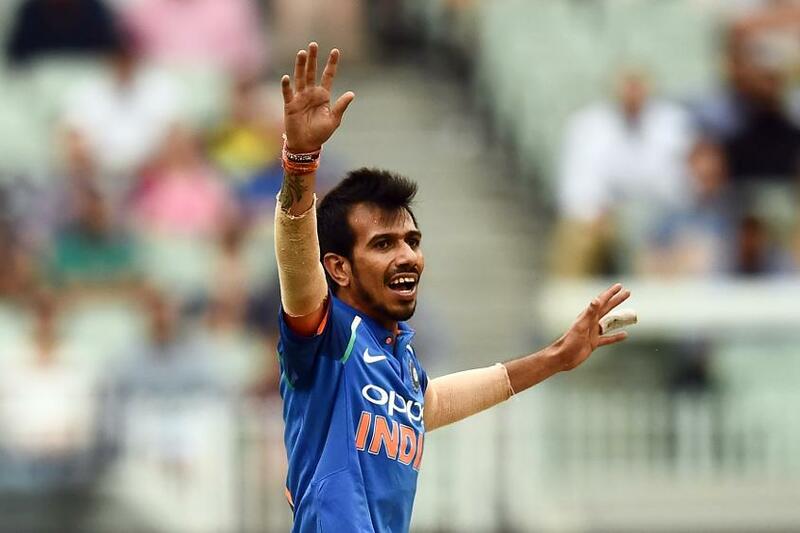 If Chahal had not snared Handscomb late on, he may even have kept the target out of India’s reach. As it turned out, India eased to the target, with Dhoni again turning back the clock.